You guys know I'm a plaintop, honeyburst / lemondrop kinda guy. I've had this on on order for about 3 months.... just came in - first impression is "wow". Better photos and review coming. Glad you like it, Marcus. I've now played four of them (checking if mine was a fluke) and they've all been dogs. By the way, that "limited" release just turned into "oh, we're doing another massive production run of them as they're popular". Stupid Gibson. Edit: one that'd been in a UK shop for a while (can only guess it was a pre-flood one) had a horrible shiny patch on the lower bass-side bout where it'd been played a fair bit and the matt finished had buffed up, so watch yourself! This one's very lively with great sustain. 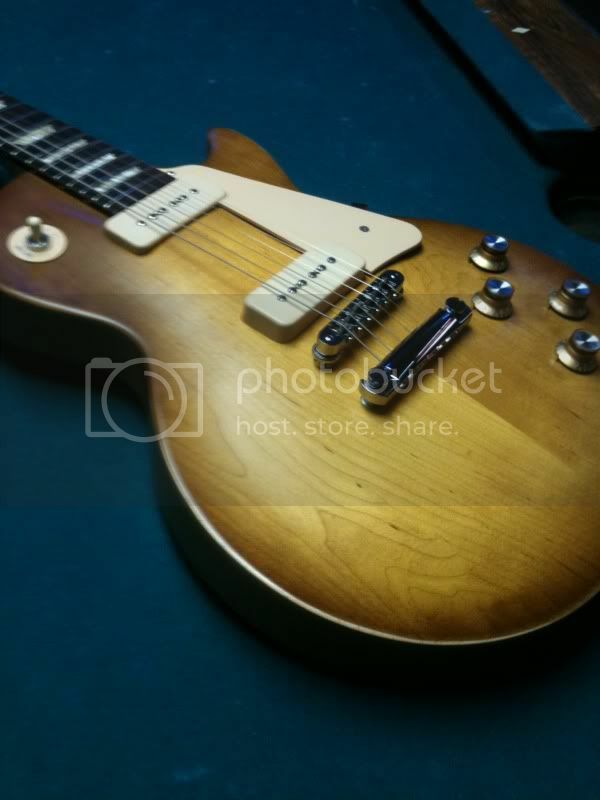 I put 11's on it, tweaked the bridge and tailpiece. Intonation was perfect right out of the box. I like the P90's in this one better than both of my Tokai goldtops. Two of my buddies had goldtops come in the same time as mine. They're nice too.... kind of a powder finish metallic. Real pretty. 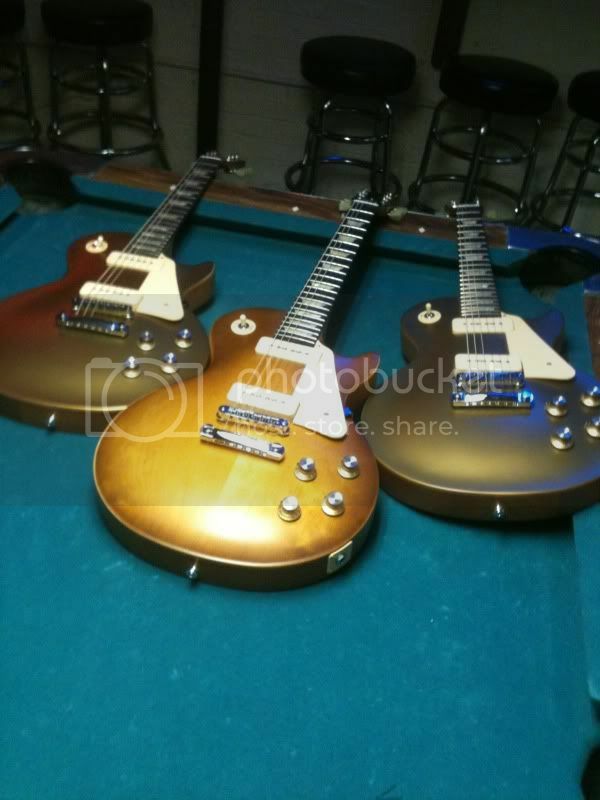 I was tempted for a goldie but honestly, a gold top looks like any goldtop. Not really, no - I loved my Studio Gem Topaz (even though it looked like a sucked sweetie). These are weight relieved, more 60s neck than 50s, and the studio gem was a heavy bugger with a full gloss finish. More trying for the early 50s LPs (hence the name!) rather than the Gem's colour gimmick thang. They're the successor in sound only as nothing else felt the same. To be fair I've not tried a guitar in a long time that didn't have at least good sustain. I just think they feel very cheap - and that's fine in the US where they actually are very cheap, but ?800 in the UK puts you into territories where you're competing with some very very big guns. Gibson P90s are very very good. Might put a pair into my tok special and get the best of both worlds for half the (UK) price! Not really, no - I loved my Studio Gem Topaz (even though it looked like a sucked sweetie). These are weight relieved, more 60s neck than 50s, and the studio gem was a full gloss finish. More trying for the early 50s LPs (hence the name!) rather than the Gem's colour gimmick thang. The burst looks nice on Marcus's, with P90's...looks like Iced Tea? 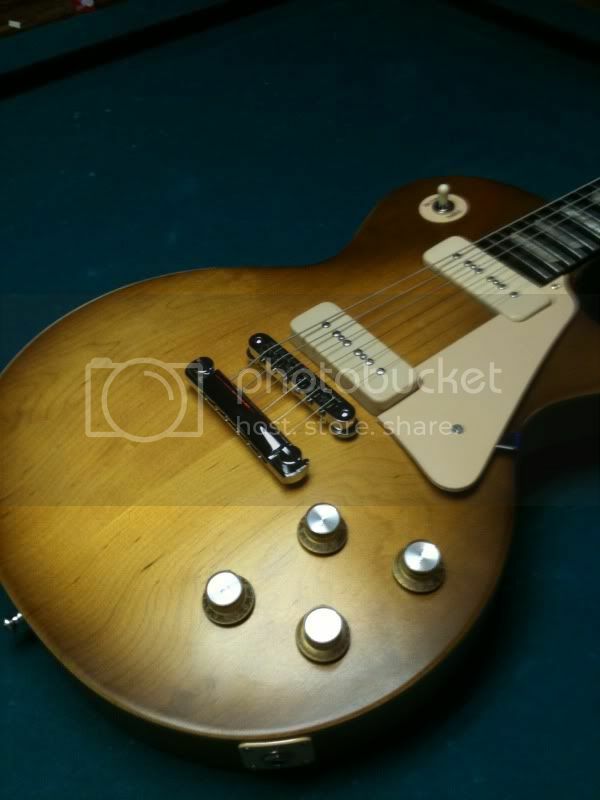 or Tokai VF? One of my buying triggers was the deal I got on it. If you can find one (goldies and honeybursts are the most scarce), street price is about $900 but you'll pay anywhere from $1000 - $1200 for them on ebay. Got mine for $685 thru a music shop owner and because we ordered three of them at the same time. At that price, it was a bargain too good to pass up and I am very pleased with the fit, finish and most of all, the tone. Nice catch, especially at that price Marcus. Very handsome finish. You say you 'tweaked' the bridge and tailpiece; what you do to them if intonation was A1 straight from the box? Curious to learn. Thanks.... I love the finish and the graining. The Gibson set up uses 10's and has the low strings higher than the treble strings.... both on the bridge and tailpiece.... I put 11's on it and leveled them out (3/32" at the 12th fret) all the way across and adjusted the tailpiece so that the strings just clear the frame of the Nashville bridge (the treble strings were resting on the bridge frame). I also lowered the neck pickup a bit. As with most P90's, the neck can get a little boomy (that's why some boutique pickups like Fralins offer the option of underwinding the neck pickup on P90's). I really just balanced the output between the two pickups a bit. The cool thing about these pickups, you can adjust the height using the two set screws on them - instead of having to raise or lower the pole pieces. I'm going to play it stock for awhile - I don't like to start swapping out hardware or electronics until I hear how it sounds out of the box - and right now, I'm very pleased with it. May consider a Faber aluminum tailpiece with locking studs - along with an ABR bridge with brass saddles. I've never been a big fan of Nashville bridges but do like the additional saddle range for intonation. Should be a great guitar for the money. Yours looks fantastic, Marcus. At $685, that's a no-brainer! If the used price on these ever comes down a bit, I wouldn't mind buying one. Thanks... I agree totally. My digital camera is on the fritz but as soon as it's up and running, I'll put up some detailed pics. But I don't care if the back looks like a butcher block - hell, it's chambered anyway and at that price, what's there to complain about? The feel and the tone are more than I honestly had expected. We have a gig coming up on Tues - big venue. I'll get a chance to hear it thru a big boy amp - that'll be the real litmus test for me.